Last month's Ethical Fashion and Minimalism: A natural fit? was the kick-off to a new topic here on INTO MIND and from the amount of feedback that came flooding in, it seems like you guys are just as interested as I am in figuring out how to make more conscious and eco-friendly decisions when it comes to building up our wardrobes. The trouble is, navigating the eco fashion waters can be a little tricky. From sizing issues to uninspired designs and steep prices: As a niche industry, eco fashion simply does not yet offer the same amount of variety as regular fashion, which can make finding an eco-friendly alternative to whatever you are looking for quite the challenge. Another key issue is a simple lack of information: We are pro sustainability and against terrible labour conditions, sure ... but what exactly is it that makes one brand more 'ethical' than another and how can we distinguish between persuasive marketing and honest environmental awareness? To shed some light on those questions I've once again partnered up with Emma from This Kind Choice: In this post we will do two things: a) tell you what key factors to look for when evaluating the ethical and environmental awareness of a brand and b) show you how to develop an eco-conscious shopping strategy that won't break the bank or dilute your personal style. what makes a brand 'ethical'? 'Ethical clothing' can seem complicated and confusing, with many different certifications, labels and claims floating around. What is a living wage? How important is organic cotton? If something isn't fair-trade, does that mean the workers are being treated badly? Can we all just give up and go for cocktails? This is a key part of all aspects of ethical clothing. When done properly, this means the company shares a breakdown of their entire supply chain, where things are sourced and where each part of the production was done. There is also a clear explanation of the conditions their workers work in and the rights they have. The company becomes accountable for the complete process of productionWhat's the first thing you hear from brands tainted by a disaster in a factory or the exposure of poor working conditions? "...complex supply chains..." "...let down by a supplier..." "...outsourced...". This adds up to "We don't know." But the reality is, they don't want to know. Knowledge is power, and power is responsibility. The responsibility to do better - this is what transparency and traceability creates. It empowers and engages us to makes better clothing choicesTransparency in the supply chain gives us perspective on the entirety of our garments, and allows us to make informed decisions about the things we buy. To truly make better clothing choices and avoid being exploited by companies eager to grab a slice of the eco/ethical pie, we need to be active consumers. And in order to be able to do this, we need information from the companies who make our clothing. how can you find out whether a brand is ethical? What do transparency and traceability look like? Honest by is a brand that exemplifies the gold standard of these qualities. The material, manufacturing, price calculation and carbon footprint of each garment is explained in a fascinating breakdown. Where else can you find out that the fibre of your organic linen dress was grown in France but spun in Hungary, or that the pattern development cost €5.91? This is inspiring, but it is not the level of transparency that is common at this stage. What should companies that are claiming to do better be able to tell us? What the clothing is made of, and where the fibre originates fromFor example, can the company guarantee that they do not use cotton from Uzbekistan, which is picked using the forced child labour of tens of thousands of children? If it is organic cotton, is it 100% organic? Where the garment is made (beyond the legal labelling requirements)This might seem to mean very little to consumers - so my Everlane silk shirt was made in a factory with 240 employees in Hangzhou, China. So what? While this doesn't mean ethical perfection, it does mean that the company is accepting responsibility for that factory and anything that happens there. It also indicates that the brand is more likely to maintain a long term, stable relationship with the factory, which results in better working relationships and ultimately better working conditions. The working conditions and rights of their workersA living wage, the freedom of association and the right to bargain collectively, humane working hours with no forced overtime... A transparent company should clearly say who makes their clothing and under what conditions. The Reformation - Sharp, chic pieces made in a closed-loop system or from 'dead stock' fabric. Free worldwide shipping on all orders. Everlane - Affordable basic tees, shirts and sweatshirts in a range of beautiful colours. A clear breakdown of where, how and by whom their pieces are made is available online, where they showcase their different factories. Everlane currently only ships to the US and Canada. People Tree - Feminine clothing and basics for work and play made under Fair Trade conditions and using almost exclusively organic cotton. Every aspect of their business model looks do better, from shipping by sea to using handlooms. Ships worldwide. ASOS Green Room - The 'greener' section of this fashion giant showcases reclaimed pieces (90's nostalgia, anyone?) and clothing made in the UK. Free delivery worldwide, as per usual. American Apparel - From swimwear to velvet dresses, this Los Angeles based company has you covered. They pay their workers $12 an hour and are vertically integrated, which means they do the entire production process from knitting and dyeing to cutting and sewing, and have control over working conditions throughout. Ships internationally. If you know any other great eco-conscious brands or shops in your area let us know in the comments! The number one thing that stood out to us from reading all of your comments and emails in response to this post is that, yes, you want to shop in a more eco-conscious way but sometimes/always find it hard to find pieces you like AND can afford. The good news is that, as sustainability issues are gaining more and more awareness, eco-friendly fashion will eventually become more accessible, varied, and affordable. Until then, all we can do is make the best decision we can within our means at any given time. Resolving to improve your shopping habits does not mean you can never set foot in your favourite high street store again or that you have to throw out all of your non-ethical clothes (in fact, that would be extremely unethical - at least donate them ;)). So, what should you do? Adopting an eco-conscious approach to fashion is not solely about buying from eco brands. A good eco-friendly strategy also includes avoiding excessive consumption, repurposing things you already own and buying for quality (so you will have to buy less in the long-term). The bottom line is: if you can't find an eco-friendly alternative for whatever you need, you have several other options to choose from. Emma and I believe in a 'next best option' strategy to eco-conscious shopping. The idea is to start out from the most eco-friendly alternative (which is always using what you already have). If that alternative is not feasible for whatever reason, you move on to the next best option and so on, until you arrive at one you can do. Can't find an eco-friendly trench coat/embellished sweater/pencil skirt that you love and can afford? No problem, just check out some second hand stores or buy a high-quality piece from a high street store that will last you many seasons to come. The exact order of those options, i.e. your decision-making process, is something you will have to figure out yourself. Emma for example is a sewing wiz, so she can easily whip up a few tees or even underwear herself as an alternative to going out and buying something new. Perhaps you have a lot of great second hand stores in your area or know a few smaller boutiques that produce ethically at affordable prices. As always we would love to hear your thoughts as well! 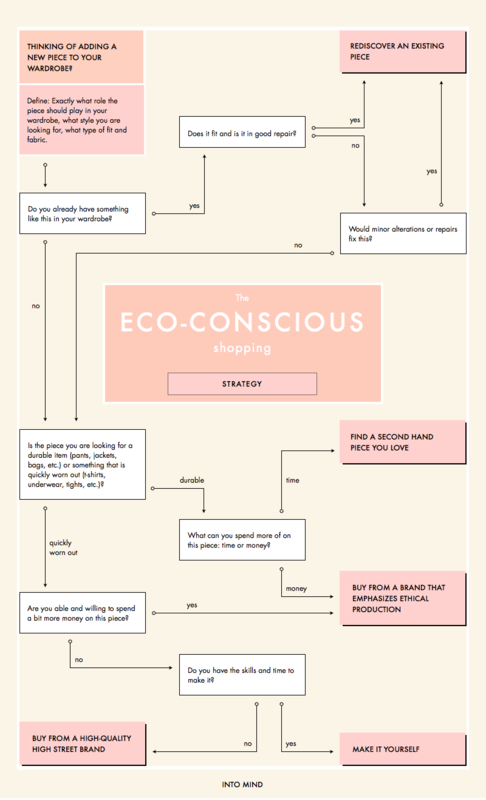 How eco-conscious is your own wardrobe and shopping strategy?